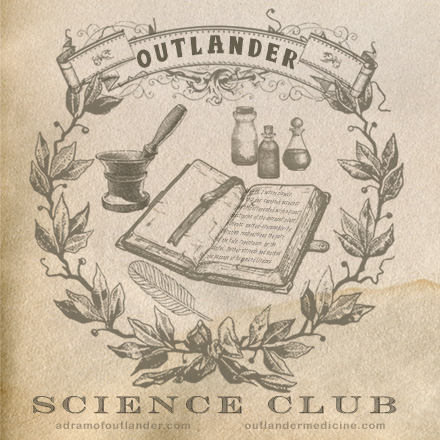 Listen to this week’s A Dram of Outlander Voyager Read-along HERE! After spending her entire adult life as a healer, first as a combat nurse and then as surgeon, Claire soon finds herself once again doctoring in 18th century Scotland. Claire’s discussion of herbs and remedies with the apothecary reveals her extensive knowledge, and overhearing this, Reverend Campbell asks Claire to recommend a remedy to help with his sister’s “nervous complaints.” Never one to refuse a person in need of help, Claire of course offers to visit Margaret Campbell to evaluate her for herself. According to her caregiver, Margaret suffers from mysterious episodes of silently staring off into space for as long as nearly two weeks at a time, followed by screaming to exhaustion, and falling asleep, only to awake unaware of what has happened. Claire finds Margaret in a state of silent staring, seemingly oblivious to her surroundings. However, aside from evidence of vitamin C deficiency and physical inactivity, her examination of Margaret reveals no significant physical ailments. What Has Happened to Margaret Campbell? Margaret’s symptoms began after she was brutally attacked by English soldiers. She had been searching for her beloved, Ewan Cameron, in the aftermath of the Battle of Culloden, when she fell into the hands of a group of English soldiers. Margaret was attacked, raped, and left for dead. Later reunited with her brother, she was never the same and spent the next 20 years alternating between a normal state of mind, a catatonic state of silently staring, unaware of her surroundings, and continual screaming. The description of sitting, staring off into the distance, not speaking, and being seemingly unaware of the people around her is consistent with catatonic behavior. Once a diagnosis of its own, catatonia is now a descriptor of rare subtypes of other disorders such as schizophrenia, bipolar disorder, major depression and PTSD. Margaret may be experiencing catatonic symptoms as part of a rare form of PTSD as a result of the trauma she sustained at the hands of the English soldiers. It is also possible that she developed schizophrenia and began to display symptoms at this time (the peak period for the onset of schizophrenia is late adolescence and early adulthood, and she would have been around 17 years old at the time of the attack). How Can Margaret Be Helped? Treatment options for catatonia include antipsychotic medications, benzodiazepines, electroconvulsive therapy as well as supportive therapy. The physical inactivity and refusal to eat in catatonia can result in muscle contractures, pressure sores, blood clots, weight loss, dehydration, electrolyte disorders, and vitamin deficiencies. Some patients will require IV fluids and tube feedings to provide adequate hydration and nutrition, as well as anticoagulants to avoid blood clots. With the resources available to her, Claire suggests a “soothing tonic” for Margaret, containing chamomile, hops, rue, tansy, verbena, and peppermint. Interesting fact: Chamomile is a member of the Asteraceae/Compositae family which includes ragweed, chrysanthemum, marigold and daisy. As a result, people who are sensitive to these may these (especially ragweed!) by experience allergic reaction to chamomile! Used for: restlessness, anxiety, sleep disorders, tension, excitability, nervousness, irritability, indigestion, as an antibacterial, as an appetite stimulant. Also has been used for dysentery, leprosy and pulmonary tuberculosis. Used for: menstrual disorders, loss of appetite, heart palpitations, nervousness, hysteria, fever, headaches, weakness of the eyes. Has been used for Multiple Sclerosis, Bell’s Palsy and cancers of the mouth. Used topically for: skin inflammation, earaches and toothaches, as well as arthritis and sprains. Has been used as an insect repellant. Interesting fact: Thujone, a component of tansy, is thought to have a mind-altering effect similar to THC (the active component of marijuana). It can be toxic to the nervous system and liver and can lead to seizures. Used for: sore throat, respiratory diseases like asthma and whooping cough, depression, hysteria, seizures, melancholia. Benzodiazepines are one of the main treatments for catatonia today. They are thought to have their action by binding to GABA receptors in the brain and increasing the efficiency of GABA in the brain. Interestingly, chamomile also binds GABA and its sedative effects may be due to the same mechanism! Along with the sedating and calming effects of the other components of this soothing tonic, Margaret may well have some improvement in her symptoms. Margaret is also suffering from scurvy, as evidenced by her bleeding, spongy gums. Once the Campbells reach the West Indies, citrus fruits will be plentiful and will satisfy this need, but for now, Claire prescribes a tea of Rose Hips to provide vitamin C to reverse Margaret’s symptoms of scurvy. Contains 1250mg of vitamin C per 100g of rose hip, making it one of the richest plant sources of vitamin C! Interesting fact: itching powder (often used by pranksters to cause dreadful itching to their victims) is made from the fine hairs inside rose hips! Check out the post It’s Green, Major, all about scurvy and Claire’s affinity for all things green! 2. Jellin, J. M. (2003). Natural medicines comprehensive database. Stockton, CA: Therapeutic Research Faculty.